She’s written the best-sellers “Miracles Now,” “May Cause Miracles,” “Spirit Junkie: A Radical Road to Self-Love and Miracles” and “Add More ~ing To Your Life: A Hip Guide to Happiness.” Gabrielle Bernstein is also not afraid to share her struggles with addiction to the everyday things — like work, people, coffee, sugar — that can leave us feeling exhausted and empty at the end of a busy day. Bernstein’s approach to spirituality is to forgive, meditate and let go of the fear in your life. She’s plainspoken yet uplifting when it comes to making changes — and she took the time to tell 24Life what it takes. 24Life: You speak often about miracles and that the universe conspires to bring them to life. Can you tell us more about what that means? What is a miracle mindset? Gabrielle Bernstein (GB): A miracle mindset is a belief system free of limitation, doubt, judgment, separation and attack. It’s unlikely that we’ll ever fully live with this mindset all the time, but our goal is to strengthen it. The more we lean toward our miracle mindset, the more our life begins to flow. This happens because when we’re connected to our miracle mindset we’re aligned with an energy of joy. That frequency of joy attracts more joy, which creates freedom and flow in our life. Quantum physics has proven that everything is energy — including you. You are an energy field and you’re responsible for the energy you give off and, in turn, the energy you receive. 24Life: Why is it so hard for so many to make time for meditation and self-care? GB: Meditation and self-care are not what we’re taught to focus on. Our society puts emphasis on achievement, hard work and “making” things happen, whereas meditation and self-care practices are much more subtle and receptive. Many Americans feel guilty slowing down. They’ve given purpose to their pain and have a belief system that suggests that only struggle will pay off. The fear of slowing down keeps people from the greatest gift we have: meditation. 24Life: How long did it take you to establish meditation as a daily practice? GB: I’ve been meditating since I was a kid. Unlike most people my age, my mother was a meditator. I followed her lead and made meditation a part of my life. For the past decade I’ve meditated at least once a day to maintain my positive flow and health. I rely on my meditation practice for my overall well-being, joy and success. 24Life: How does one choose a meditation style? There seem to be so many available. GB: I believe your meditation style chooses you. The whole time I’ve been on my spiritual path, I’ve always been intuitively led to the practices that have served me most. As I’ve grown spiritually I’ve been guided to new practices that can serve my expansion. In my blog post “The Beginner’s Guide to Meditation,” I offer great suggestions on where to start and what types of practices are available to you now. 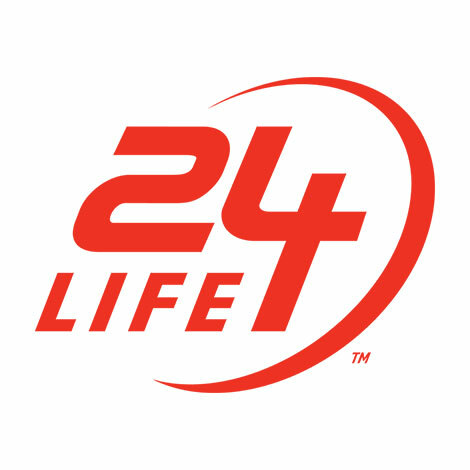 24Life: You have been very public in sharing your progress and struggles with addiction — coffee and sugar, most recently. What advice would you give someone trying to make changes in their lives? You gotta want it. Your willingness is crucial in getting sober. When you become willing to choose to get clean, you open an invisible door and all the resources you need will be given to you. Continue to strengthen this willingness daily by reciting this affirmation: “I am willing to change and I welcome guidance and support.” This simple statement will put your recovery in motion. Turn inward. Addiction stems from searching outside yourself for what you already have within yourself. That’s the sneaky thing about it. You can look far and wide for happiness, but as long as you’re looking outside rather than toward your own inner wisdom you’ll always fall short. The key to recovering from addiction is to establish a deep inner awareness. You can call this intuition, a connection to the universe, spirit, higher power or God. It doesn’t matter what you call it. All that matters is that you choose to turn inward. The way we do that is through prayer and meditation. Through prayer we ask for guidance and through meditation we can hear it. Redirecting our search for peace from the outside in is the most crucial step to healing an addiction. When you think you’ve surrendered, surrender some more. When people ask me how I’ve stayed sober for nearly 10 years, my response is: daily surrender. On October 2, 2005 I surrendered to a life of recovery. I’ve been surrendering every day since. As you practice step two and establish a spiritual relationship of your own understanding, you’ll come to know what it truly means to surrender your will to a power greater than yourself. This practice requires faith and trust that there is a spiritual plan for you and guidance working on your behalf at all times. I EAT RIGHT, THINK RIGHT, SLEEP RIGHT, BREATHE RIGHT AND MOVE RIGHT. IF I CAN COVER THOSE BASES THEN I FEEL IN BALANCE. 24Life: So what closing advice would you offer readers? GB: Trust me when I say that your spiritual faith will be your greatest tool for maintaining and sustaining a life of recovery. You don’t need to know how or when you’ll gain this faith. It will be bestowed upon you as long as you stay in constant dialogue with your inner wisdom. 24Life: Could you pull a miracle card from “Miracles Now” for our readers? Gabrielle Bernstein has been named “a next-generation thought leader” by Oprah Winfrey. She appears regularly as an expert on “The Dr. Oz Show” and has been named “a new role model” by The New York Times. She is The New York Times bestselling author of “Miracles Now” and “May Cause Miracles.” Her two additional bestsellers include “Add More ~ing to Your Life” and “Spirit Junkie.” Bernstein is also the founder of HerFuture.com, a social networking site for women to inspire, empower and connect. Learn more at http://www.gabbyb.tv.